When was Golf invented? Various stick and ball games have been around since ancient times played by the Chinese, Mesopotamians, the Ancient Egyptians, Romans and early Europeans, but the game of golf was invented in Scotland in the 12th century. The Scots added a unique element to their game that differentiated it from all other stick and ball sports, namely the hole. The first golf clubs, balls, courses and rules all originated in Scotland. Who invented Golf? The name of a specific person has never been credited with the original invention of Golf. However, the modern golf ball, with a wound core, was invented by Coburn Haskell in Cleveland, Ohio in 1898. George Franklin Grant invented and patented the first golf tee in 1899. Miniature golf was invented in 1930 by the American inventor Garnet Carter and the first powered golf car was invented in 1963 by Merlin L. Halvorson. Definition of Golf: The Golf is defined as a game played with a small ball and a variety of clubs on a large open course with 9 or 18 holes. The objective of the game is to make as few strokes as possible in playing all the holes with the winner having made the fewest strokes at the last hole. The Origins of Golf: The specific origins of the game are unclear but it can be speculated that it began when children, using the crook end of shepherd staffs, rummaged about in groves for walnuts. The walnut could have subsequently be used as a ball, and the crook as a club, to play a fun, new game. Perhaps it began with how far someone could hit a walnut and then adding the difficulty of aiming the walnut into a hole in the ground. It also seem reasonable to speculate that kids found it easier to play their game on a field, rather than in a leafy walnut grove, and that someone had the good idea of covering a walnut with whitewash, so it could be seen more easily. Fact 1: Who invented Golf? The name of the inventor of Golf is unknown but it is believed to have originated during the 12th century in Scotland. Fact 2: Who invented Golf? Prior to the invention of Golf by the Scots many civilizations played their own versions of stick and ball games and evidence of their sports can be found in paintings in ancient tombs and references in early written documents. Fact 3: Who invented Golf? The ancient games, often played and depicted with curved sticks have led to theories that they were playing a form of golf. For instance the Romans played a game called "paganica" in which the players used a bent stick to hit a stuffed leather ball. But paganica was a rowdy game played with a large ball - not at all like golf but more similar to Hockey. Fact 4: Who invented Golf? Evidence of other ancient ball games, played with a curved stick, include "Bu Da Qiu" in China, "Genna" in Ethiopia, "Beikou" in Mongolia and "Keretizein" in Ancient Greece. The ancient civilizations of the Romans, Celts, Olmecs, Aztecs, Toltecs, Incas and Native American Indians all played games with bent sticks. Fact 5: Who invented Golf? The common element of these ancient ball games, that have led to comparisons with golf, was the curved stick and a ball. The widespread use of a curved stick by so many civilizations originated with the improvisation of games using a shepherd's crook or staff or crook, or curved bones or cattle horns. The balls used were of varying sizes, all much bigger than golf balls, and were played as boisterous team games involving numerous players. Fact 6: Who invented Golf? But none of these ancient games were like the game of golf, that aimed to drive a small ball into a small hole in the ground. Fact 7: Who invented Golf? The sports that most closely resembled golf were the game of Chole, which still survives in parts of Belgium and Northern France, and Kolven a game that originated in the Netherlands. Both Chole and Kolven resemble something like a cross between hockey and golf. Fact 8: Who invented Golf? Whatever the exact origin of the game was it is certain that golf was first played in Scottish fields, common land or in coastal areas amid sand dunes, and these areas were then reserved as golf courses or 'links'. A 'links' is the oldest style of golf course, that was first developed in Scotland. The word "links" comes via the Scots Gaelic language meaning "rising ground, ridge". Fact 9: Who invented Golf? There is a common misconception is that the word GOLF derives from an acronym for 'Gentlemen Only Ladies Forbidden'. The word 'golf' actually derives from the Gaelic word 'Gowf' meaning "stick, club, bat". Fact 10: Who invented Golf? The ancient word 'gowf' is still retained by the Loudoun Gowf Club in Galston, Ayrshire that takes its name from the private Gowf field of the Loudoun family. The original Loudoun estate was established near Galston in 1127 and covered 45,000 acres - plenty of room to dedicate a few fields to the game of 'Gowf' when the game became fashionable. Fact 11: Who invented Golf? The origins of the modern game of golf date to Scotland in the 13th century. The first written record of golf dates to 1457 when a law was passed by King James II's Scottish Parliament banning ordinary people from playing the game of golf (and football) on a Sunday because it interfered their archery practise, which was compulsory military training to prepare the country with the wars against the English. The ban was eventually lifted nearly 50 years later, in 1502 when the Treaty of Perpetual Peace was signed between King James IV of Scotland and King Henry VII of England. Fact 12: Who invented Golf? In the same year, 1502, the accounts of King James IV of Scotland detail the purchase of a set of golf clubs by from a bow maker of Saint John's Toun (town), which was the ancient name for the city of Perth in Scotland. Fact 13: Who invented Golf? The skills of bow makers, with their expert knowledge of working in wood and its strengths and weaknesses, would have enabled them to make excellent golf clubs. However, ordinary players would have initially carved their own clubs and balls from wood. Fact 14: Who invented Golf? Depictions of golf can be found in a Medieval manuscript (1520 - 1530), known as the 'Golf Book of Hours', a collection of devotional texts illuminated by Simon Bening and famous for its depictions of sports and pastimes. The manuscript takes its name from one of its illustrations which shows an early game of golf. Fact 15: Who invented Golf? For a long time, golf clubs were made of hard wood and known by a number of different names that typically described how they looked, such as ‘longnoses‘ for long range driving and ‘spoons’ for taking short range shots. Wedges were called niblick clubs. Iron clubs were forged by blacksmiths up until the late 1800’s. Fact 16: Who invented Golf? Musselburgh Links, the Old Golf Course in Musselburgh, East Lothian is generally recognised as the oldest golf course in the world. Mary, Queen of Scots reputedly played golf on Musselburgh Links in 1567. Fact 17: Who invented Golf? The Old Course at St Andrews in Fife is considered by many to be the "home of golf" and the first recorded evidence of at St Andrews is dated 1552. The Society of St Andrews Golfers who played at St Andrews Links, founded the Royal and Ancient Golf Club of St Andrews in 1754 and introduced the first standardized rules of golf. Fact 18: Who invented Golf? Wooden balls gave way to some extent to the better controllable 'Hairy Balls' (leather balls filled with hair) which dated to at least 1554 and were made by the 'cordiners and gouff ball makers of North Leith'. The 'Hairy Balls' were prone to water damage and in 1618 the 'feathery ball' was invented. The 'feathery ball' contained enough feathers to fill a Top Hat and despite its name was extremely hard and resilient. Producing a 'feathery ball' was time consuming and a gouff ball maker could only make 2 -3 balls in a day. Fact 19: Who invented Golf? The game was introduced to the colonies of America by the early settlers. The first reference to golfing in America was in a 1659 when an edict by Dutch officials at the Court of Justice in Fort Orange (the first permanent Dutch settlement in the New Netherlands, present-day city of Albany, New York) banned the playing of golf in the streets of the settlement. A fine of 25 florin was imposed on anyone who broke the law. Fact 20: Who invented Golf? In 1682 the first golf caddy by the name of Andrew Dickson carried the clubs of the Duke of York on the links of Leith. The term 'Caddy' derives from the French word 'le cadet', meaning 'the boy'. Fact 21: Who invented Golf? In 1786 the South Carolina Gulf Club was established in Charleston and was the first golf club in America. Fact 22: Who invented Golf? In 1848 the 'Gutty Ball' was invented Rev. James Patterson of Dundee, made of gutta-percha gum, called ‘gutties’ which were much cheaper and quicker to manufacture and began to replace the featheries. The first 'Gutty Ball' was smooth but players noticed that the more the ball became nicked and marked the easier it was to predict their shots. Fact 23: Who invented Golf? Robert Forgan, the St Andrews club and ball maker, produced a gutty with surface markings to enhance its aerodynamic qualities and sold the first guttys with surface patterns in the 1860's. Fact 24: Who invented Golf? 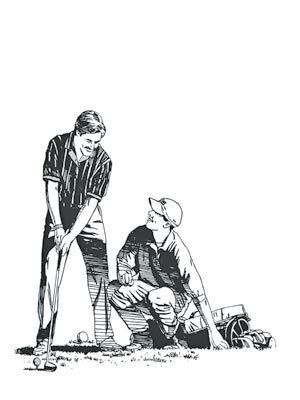 The first book on golf instruction called 'The Golfer's Manual' was written by H. B. Farnie and published in 1857. Fact 25: Who invented Golf? The modern golf ball, with a wound core, was invented by Coburn Haskell in Cleveland, Ohio in 1898. The Haskell Ball consisted of a solid core wrapped tightly with rubber threads that was covered with a pitted layer of gutta-percha. Fact 26: Who invented Golf? The United States Open was instituted in 1895 with Willie Anderson as the first winner. In the same year first 18-hole course in the U.S. was opened in the Chicago Golf Club. Fact 27: Who invented Golf? George Franklin Grant (September 15, 1846 – August 21, 1910), the first African-American professor at Harvard, invented and patented the first wooden golf tee in 1899, patent number US 638920. Fact 28: Who invented Golf? The first time a dimple pattern was applied to a golf ball was in 1905 patented by William Taylor in England. Fact 29: Who invented Golf? Miniature golf was invented in 1930 by the American inventor Garnet Carter (February 9, 1883 - July 21, 1954) and built the 'Tom Thumb course' on Lookout Mountain in Tennessee. Fact 30: Who invented Golf? The first powered, self-propelled, golf car was invented in 1963 by Merlin L. Halvorson. Fact 31: Who invented Golf? In 1972 Spalding introduced the first two piece ball, called the Executive. In the following year the graphite shaft was introduced. Fact 32: Who invented Golf? The equipment used today is manufactured with state-of-the-art technology using materials such as titanium, graphite and steel. Different elements and requirements for maximum performance are taken into account such as swing accuracy, weight distribution, durability, and distance.